Google has its own website goo.gl for URL shortener active since last year added to one more service to its account and now recently launched Google Plus a social networking site while Facebook remaining at the top in the niche. has but it doesn’t have any feature which allows users to shorten their Profile URL and now Google introduced a special URl service for Google Plus users Gplus.to - A website works as an URL short­en­ing ser­vice for Google+ Profiles. 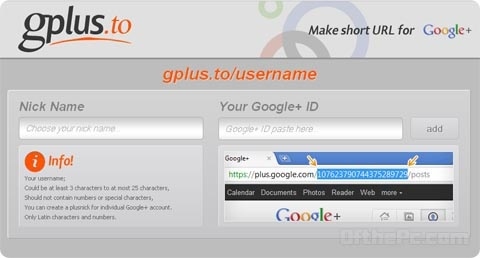 Gplus.to gives you option to have a custom url for your Google Plus profile. It will make your Google+ Profile URL shorter and will be eas­ier to share with your friends.